This is how you want to head into the playoffs. Shaking off a long wait to get on the court Friday at Granite Falls, the Coupeville High School varsity girls hoop squad responded with “great energy,” claiming a 38-29 win. The victory gives the Wolves a season sweep of the Tigers while lifting them to 6-4 in North Sound Conference play, 8-9 overall. Coupeville, which was picked to finish fourth in the preseason coaches poll, instead heads to districts as the #3 seed from the six-team NSC. The Wolves open the double-elimination tourney Feb. 4 against the #2 team from the Northwest Conference, Lynden Christian (17-3). Win or lose, they’ll be back on the court, and on the road, Feb. 6 to play either King’s (16-4) or Sultan (7-13). While its playoff path was already set before it played Friday, Coupeville wanted to end the regular season on a positive note. “Long wait for game time. Sat through both JV games and an interrupted pregame due to senior festivities,” Wolf coach David King said. CHS blew out to an 8-0 lead to open things, hushing the fans and giving the Tigers a taste of what was to come. Granite wasn’t ready to crack, however, netting a three-ball to finally get on the scoreboard at the end of the first quarter, before banking home a quick bucket to open the second frame. That was the cue for Wolf senior Ema Smith to go to work, as she rained down 10 of her game-high 12 in the second quarter. One, two, three, she shredded Granite’s defense for a trio of three-balls, then capped things with a free throw, sending Coupeville to the break up 21-14. The two teams exchanged body blows in a very close second half, but the Wolves reached deep and always found an answer when they needed one. Defensive dynamo Tia Wurzrainer got wild on the other end of the floor, popping home a pair of key buckets, while Lindsey Roberts swished a big-time three-ball in the fourth after the Tigers had sliced away at Coupeville’s lead. 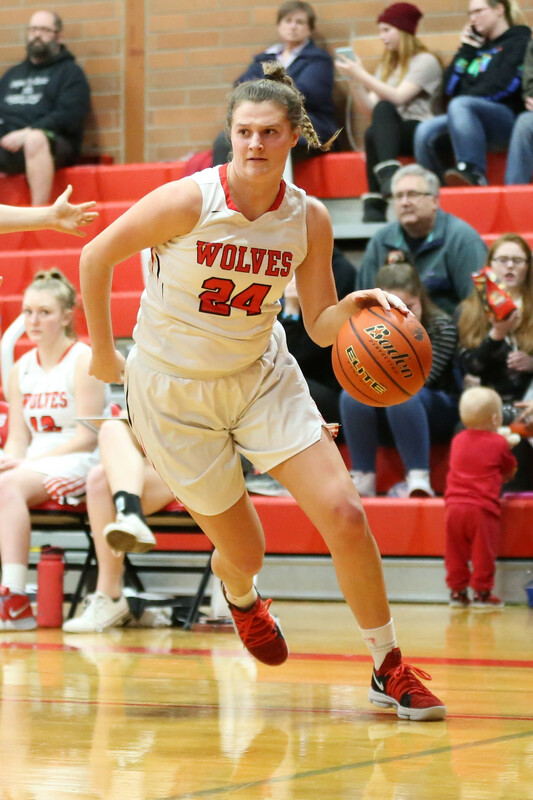 The Wolves played with solid energy on defense, typified by Hannah Davidson, who “came up big with four steals,” including one on which she stole the ball at the free throw line, then led the fast break. “Posts, they always want to play the point guard position,” King said with a big smile. Coupeville flustered their foes with quick hands (Ema Smith and Chelsea Prescott chipped in with five and four steals, respectively) and hit the boards with intensity. Ema Smith and Roberts paced the Wolves on the glass, ripping down eight rebounds apiece. The senior captains also led the team in scoring, with 12 and 10, while Wurzrainer, Scout Smith, and Prescott each had four and Avalon Renninger and Davidson added a bucket apiece. With a pair of baskets in the first quarter, Roberts passed Cassidi Rosenkrance (423), Mika Hosek (424), and Sarah Powell (425) on the CHS girls career scoring list. Sitting with 432 points, the four-year varsity player enters her final playoff run as the #20 scorer all-time, coming up fast on #19 Maureen Wetmore (438) and #18 Vanessa Davis (448). With seven of his eight regular varsity players scoring Friday, and point guard Scout Smith “doing a great job with her passing,” King got the boost he was hoping for as his team preps for the postseason. “This was a good bounce-back game for us after a tough schedule in our last two games,” he said. “Very proud of the team in the regular season and especially in league play.